"The Official/Unofficial SVT Header Conversion Guide"
Well, I've noticed that a lot of questions concerning the SVT header conversion are coming up. I was in the same boat last summer when I wanted to do the swap, so my goal is to make writeup that can (hopefully) answer all of the necessary questions...so here it goes. 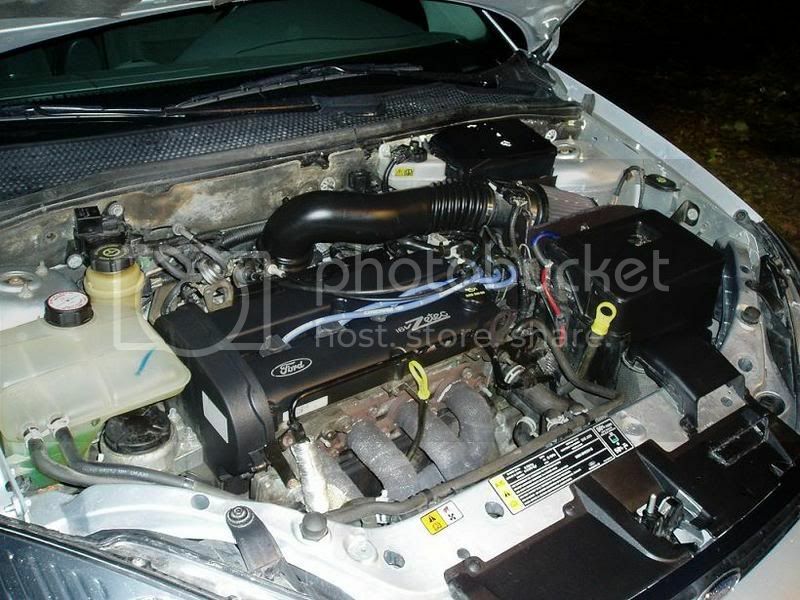 A Little Into-The SVT header is (IMO) the best long tube header for a Zetec Focus. It came stock on all SVT's, and is made of stainless steel (however, due to the quality of stainless, there is typically some surface rust on them). The SVT header also relocates the catalytic converter to a 'normal' position under the engine, whereas the regular Zetec has the cat on the front of the engine. What to expect-On a car with normal mods, such as an intake system and a cat-back exhuast system, gains should be somewhere around 8-10whp. This will obviously vary slightly, depending upon what you choose to use as a cat (more on this later). NECESSARY Parts-Here is what is absolutely necessary to do the swap to a regualar focus. -Bolts/washers for the header to head, header to cat/orp, cat/orp to flex, flex to catback. Recommended/Optional Parts-These are parts that you may want to get, but there are ways to get around it. -SVT Power Steering Line-The stock Zetec line runs too close to the header for it to safely be used. There have been many people how have used their stock line, which has gotten too hot, and exploded. However, you can get away with using the stock line by bending it slightly out of the way, and having some sort of a coating on the header to keep heat down (ex.-header wrap). The PS line is the black tube that runs above the header, and then goes down next to it on the left side. You can see that it is wrapped in an insulator (the alluminum looking tubing over it), and that it is also bent slightly so that it does not touch the header. Here is where you need to make your major decision. The stock catalytic converter is not compatable with the SVT header, as it mounts in an entirely seperate location. Each of the pieces you can use (SVT cat, high flow cat or ORP) have their benefits. The stock SVT cat will definately allow you to pass emissions and will also keep the noise level to a minimum. The off road pipe (ORP), which is basically a piece of pipe that eliminates the catalytic convereter, is not emissions legal, and can get you a ticket. However, it will yield the largest performance gains. But, it is loud, has a high air pollution level, and will present issues if you live in an area where emissions testing is done. The high flow cat has the best of both worlds. It keeps the car quiet, gives it great gains and is legal, but relatively expensive. This part is only necessary if you decide to use the off road pipe, and do not plan on getting your car tuned (with something like the xCal2). What it does is basically 'turn off' the rear oxygen sensor, tricking the computer into thinking that the emissions system is functioning properly. Another option is to leave the rear o2 sensor active, and just live with the check engine light on your dash, as there really shouldn't be any performance problems... only that annoying light. However, if your car is going to be tuned, the xCal2, for example, can simply disable the rear oxygen sensor, rendering MIL eliminators relatively useless. If you intend on reusing your oxygen harness, you will need to buy one of these special tools. It is basically a socket that allows you go unbolt the sensor from the pipe. They can be found at just about any part store. If you are not using your oxygen sensor again, you could go without this tool and just leave the sensor in the old pipe. These are entirely optional. If you decide to use the rear oxygen sensor, you need someway to hook it up, as the stock wiring is not long enough (because the cat was relocated by using the SVT header). You can either buy these little extentions that plug into the stock plug and have another plug on the other end that will reach the sensor in its new location. Or...you can cut the stock connector off, use some extra wiring you have lying around, connecting one end to the stock harness and the onther to the wiring on the sensor. Just a little heads up here. 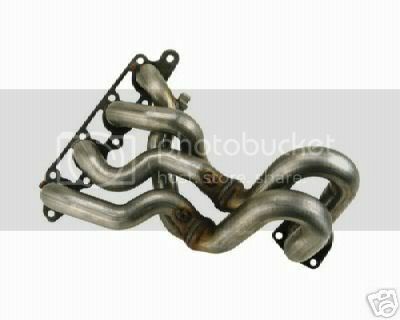 If you buy a used header from an SVT focus, there are no provisions for the EGR tube from the factory manifold. Your options are to either have an EGR bung welded into the header, or just not attach it, and plug the tube (you'll get a check engine light for eternity). This CEL can be disabled with the xCal2 by turning off the EGR system (if you plan on getting a tune eventually, that way you can avoid spending extra money having a bung welded in). Or, if you buy the Ford Racing kit or the one from McNews, those headers do have provisions for the EGR, and my above advice can be disregarded, but I did need to mention this. Header wrap, or header tape as I've also heard it called, is a great way to keep exhaust temperature inside the header instead of under the hood where the air should be cold. Keeping the heat in can help expel the heat faster and theoretically increase power. It sort of has gotten a bad rap (no pun intended...) because it can seal in moisture underneath it, and cause rust. However, the SVT header is stainless, so rusting through sholdn't be much of a concern. Also, there is a spray on silicone coating available that will help to waterproof the header wrap. If you plan on using header wrap and the silicone coating, make sure you do it before the header is on the car, because it would be nearly impossible to do once intalled. As far as purchasing all of the parts. First decide on what you want to do, and what you need to buy. Then, check out the parts section of this site, as you can locate a lot of stuff used and get great deals on it (thats where my header and ORP came from). If you want to buy new, you can check out places like McNews (www.mcnewsautomotive.com) or CFM (www.c-f-m.com). I know that McNews sells a kit that will give you just about everything you need, but the price can be hard to swallow (it was for me...that's why I went used). Remember, if you buy the header used, you will have to either disable the EGR system, live with a check engine light or have a bung welded in. If you buy the kit new, you don't need to worry about this. Process-I think that sums up all of the parts that you need or may want to buy in advance. The process for installing the header is relatively straightforward, but can be time consuming due to rusty bolts that are unwilling to break free withough breaking the heads off (this is why I recommended buying all new hardware). 2) Disconnect the catback system from the flexpipe. 10) Here is where the only snag will come in. The SVT flexpipe does not exactly line up with a ZX3 catback. Therefore, the flange will have to be drilled out until the bolt holes line up. Then, use new bolts with washers to mate the flexpipe to the catback. 11) Check that the pipes all line up correctly and tighten all of the bolts to their specified torque. 12) Check the PS line for clearance with the header. Slightly bend it out of the way and try to insulate it somehow. Or, install the SVT line. 13) Reconnect battery, start the car and check for leaks. In order to minimize the risk of a leak between the header and manifold, you should start the car and allow it to get up to run for increasing amounts of time, then shut it off and allow to cool. This SHOULD stop any leaks from showing up. The final product should look something like what I have on my car below. By the way, my car has a SVT header (bought used), SVT ORP and flex with a Borla ZX3 catback. It is loud, but I haven't gotten pulled over for it or anything. There is a definate increase in power tha really wakes up the car compared to stock. That should be everything. Go out and enjoy your new-found power and sound!!! Hopefully this will answer the most common questions that show up concerning this swap. I know I scoured the forums to answer all of my questions when I did it, so I thought one thread that has the information could be helpful. Let me know if I missed something or messed something up and I'll change it. felixthecat and Wogatzke like this. Good job dude. TO the "stickies"! Looking for the following: XCal2, 2xDiablosport MAFia, 2x Quality BOV & Wastegate, Steeda Tri-Ax Shifter 00-02, 24mm RSB, Rear SVT Brake Kit, Driver side VF, and more ... PM ME! Yes, I agree--this should be stickied, unless it already has been somewhere else. "I flushed a bag of skittles down the toilet yesterday and watched a NASCAR race in 8 seconds flat." Thanks guys....so now that it's stickied, could a mod change the title so 'unnoficial' is spelled right....stupid typos..lol. I figured it was time to try to put a thread together that answered most of the questions and concerns with the SVT header. so this means.. there is no possible way that i can bolt the svt header onto my zetec exhaust w/out buying the new cat or ORP? You can see if you can find a Stock SVT Cat or find a Used R/T Highflow or ORP used made for the SVT Header Conversion. Here's how it looks : SVT header kit with 2.25" Random Technology "RT" hiflow-Cat and Flex . Just came in today ( March 13 2007 ) . Last edited by mpcv2000; 03-27-2007 at 11:29 AM.